Food allergies and intolerances are two different conditions which often have similar symptoms. They are both examples of adverse food reactions, however food allergies involve the animal's immune system while food tolerances do not. A particular component of food (usually a protein) triggers the susceptible animal's immune system to react, for example cells may release histamine which causes itching. Something in the food doesn't agree with the animal's body but does not trigger the immune system to react, for example a dog may not be able to digest cow's milk well. Itchy skin (also known as pruritus) and digestive upsets are the most common symptoms of an adverse food reaction, although ear problems can also occur in some dogs. It is important to remember that these are all symptoms that can also develop from non-food allergies as well. It is common for people to assume that itchy skin is caused by a food allergy but true food allergies in cats and dogs are relatively rare1; they are responsible for only 1% of all skin diseases in dogs2 and are only the third most common occurring skin allergy after flea-allergy and atopy (sensitivity to an environmental trigger like grass, dust or pollen)3. Allergies and intolerances are poorly undersood in companion animals and don't necesssarily behave the same as similar conditions in humans. Gaining an accurate diagnosis may take time and can be frustrating for pet owners, although ultimately rewarding. With instructions from a veterinary professional, an elimination diet trial should be conducted, to remove the suspected food allergen from the diet (includi ng any treats and extras) for an extended period of ti m e. Keeping a food d iary a nd a record of changes to clinical signs could be part of the diagnosis process. ‘Challenging’ your pet with a food allergen to see if a reaction occurs is the final step in an elimination diet trial. The aim of these trials is to identify the food allergen. This is hugely beneficial as you can then avoid feeding it to your pet, which means he/she will be able to live a comfortable and healthy life. • Hydrolysed diets are composed of very small protein molecules.The aim is for these small molecules not to be recognised by the immune system, reducing the risk of an allergic reaction. • Novel protein diets include a single protein source which the pet has never eaten before and therefore hasn’t developed an allergy to. Examples of novel proteins include duck, salmon, venison and whitefish, or even more exotic ingredients such as kangaroo. • Homemade diets are another option to control the ingredients in your pet’s food. Preparing these can be time consuming and difficult to balance, meaning they frequently provide inadequate long-term nutrition. For this reas on, home made diets are often used as a temporary measure until the right pet food product is identified. 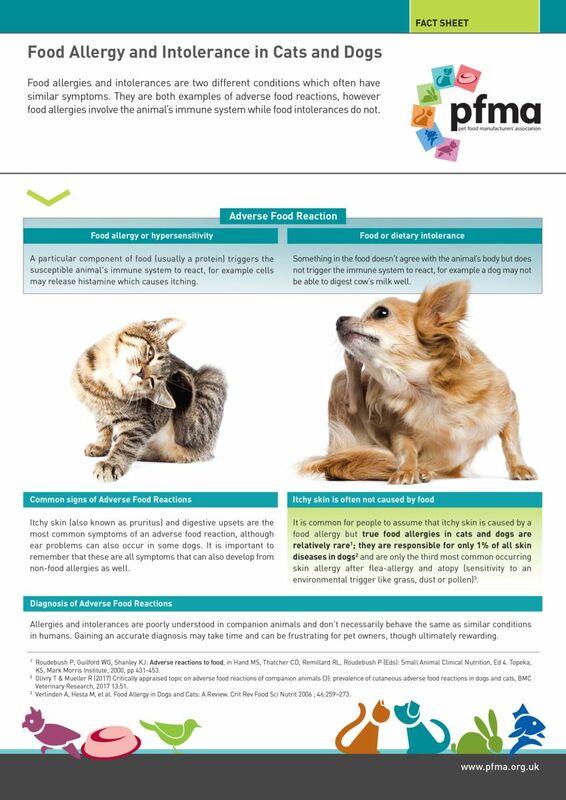 Food allergies and intolerances can be serious medical conditions, affecting the health and wellbeing of your pet, therefore it is always advisable to seek veterinary attention if you suspect these conditions. It is also important to read your pet’s food labels carefully. To understand your pet food labels please refer to ourguide; PFMA Labelling Factsheet.